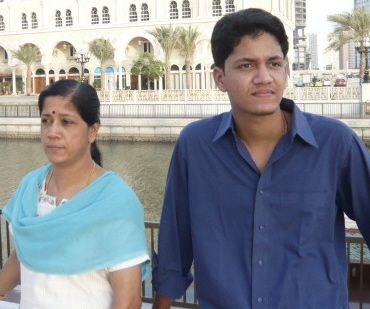 On October 18, 2009, Sumithra left for Chennai, India by Air Arabia flight to take care of Sudharshan who was suffering from high fever, due to viral infection. Sudharshan was already in Chennai, having travelled from Bengaluru by bus with fever. Following appropriate medication, Sudharshan got fully recovered and both Sumithra and Sudharshan have returned to Bengaluru. Having gone there, she has decided to stay till January to attend Srinandini's wedding so that she could also take care of Sudharshan's needs while there. Sudharshan is heading for his examinations soon.